The seven countries of South Asia include Bangladesh, Bhutan, India, the Maldives, Nepal, Pakistan, Afganistan and Sri Lanka. South Asia extends south from the main part of the continent to the Indian Ocean. The principal boundaries of South Asia are the Indian Ocean, the Himalayas, and Afghanistan. The Arabian Sea borders Pakistan and India to the west, and the Bay of Bengal borders India and Bangladesh to the east. The western boundary is the desert region where Pakistan shares a border with Iran. 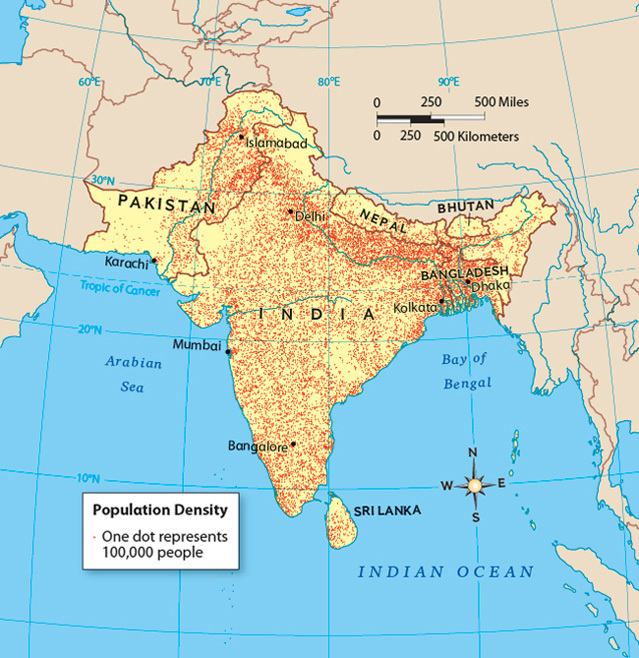 The climate of south asia varies from the variety of areas. The climate ranges from tropical monsoon in the south to a mild temperature in the north. This large variety is influenced by the altitude and the proximity to the sea coast and the seasonal impact of the monsoons. A monsoon is a seasonal shift in the prevailing wind direction, that usually brings different kind of weather. It is a seasonal prevailing wind in the region of South and Southeast Asia, blowing from the southwest between May and September (the wet monsoon) and bringing rain, or from the northeast between October and April (the wet monsoon). The climate of South Asia is largely characterized by monsoons. Southern parts of South Asia are hot in the summers and receive rain during the monsoon period. The northern part is hot in the summer and cooler in the winter. The northern mountain regions are colder leading to to snowfalls, especially in the Himilayan ranges.